As we all know, RVing and camping can be quite fun. However, we often face an enemy who tries to take away that fun and that enemy is dirt. See, dirt can be quite a nuisance and extremely hard to keep away from your RV. With this in mind, we thought we’d provide you with an in-depth guide about the best defenders against this dirt plague: RV patio mats. In doing so, we’ll give all the tips and information you need to find the best RV patio mat possible. Honestly, we want to make your RVing experience the best it could be, and an RV patio mat is a product we believe will help you get there. It may seem a little crazy, but with the right patio mat, it could make a big difference and start removing dirt from every crevice of your life. And once we help you find the right RV patio mat, this dream will become a reality and dirt will become less of a problem in your RV. Of course, it never goes away completely. After all, it’s a lifetime enemy, but these mats will drastically reduce its presence in your life. In this section, we’ll review the best RV outdoor mats on the market in an attempt to help you discover the perfect one for your RV. Each review will discuss a multitude of factors that you’ll find more about in the sections following the product reviews. Our first product, the Reversible Mats Outdoor Patio RV Camping Mat is a mat any RV owner should consider getting to fulfill their patio mat needs. And since it comes from a company, Reversible Mats, which will be featured on this list more than once, you can be sure it’s high quality. For example, I love that it’s made from breathable material. See, this material will make sure the mat doesn’t hurt the grass below it. For an environmentally conscious person like myself, I consider this feature a must. Another must-have feature is the material being mildew and mold resistant, which will help decrease the damage the rain will do to the mat. As someone who tends to leave things out in the rain, this feature would be undoubtedly helpful. As would the UV protection this mat has, see, this protection will help reduce the chances that sun damage becomes an issue. With this in mind, I wouldn’t have to worry about leaving this mat out in the sun during those hot, sunny summer days. Its features like these that make me feel confident in a company like Reversible Mats. And throw in the fact you have three different size and three different color options, you can tell this company has their customers in mind. In fact, they even added in a carrying bag without pushing the price to astronomical levels. You’re probably saying why don’t we buy this mat right now? Well, in the customer reviews, there were a few complaints about the material being easily ripped. And since I plan on taking this mat across the rough terrain of the Pacific Northwest, I’m not going to risk spending money on something that’ll rip easily. However, if you plan on staying in the safe confines of an RV campground, this mat could be a great option. The Camco Large Reversible Outdoor Patio mat is another breathable mat that will help protect the grass under it, but it also excels in many different areas as well. Honestly, at this price, you couldn’t do much better. See, this mat’s UV protected against sun damage making it a worthwhile choice to consider for anyone RV owner going on an extended camping trip. And since it has multiple size options, this mat could easily be an excellent option for a camper owner. Another aspect I love is how the material is mildew and mold resistant, which allows for the mat to have multi uses. For example, I could easily see myself setting this up outside on my pool deck at my actual home. It would do wonders to help reduce the amount of water that gets on the pool deck. As a result, you shouldn’t be shocked to learn it’s also effortless to clean; all you have to do is hose it off, and it’s as good as new. But none of the features mentioned above is the thing I love most about this mat; this honor goes to this mat’s corner loops that you can easily put ground stakes inside. With the ground stakes inside, this loops will prevent your mat from flying away. As someone who plans to camp in the Pacific Northwest, this feature would be a godsend facing all northwestern wind. But sadly, there are a few drawbacks that will prevent this mat from coming on my trips. First, just like our first mat, this one is also prone to tearing. I just can’t see myself investing in a mat that is known to starting ripping in rough terrain. And secondly, there’s no carrying bag. And since I don’t have a lot of space in storage, this poses a significant issue. 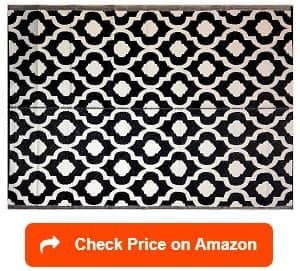 The Ming’s Mark Reversible Patio Mat is an affordable mat made from high-quality, breathable polypropylene material. So, in this regard, it meets my mandatory requirement of it being grass-friendly. Besides meeting my grass-friendly requirement, the manufacturer also gives you a ton of different options regarding design and size. For me, I think the blue/beige version would fit perfectly outside my camper; it’s a beautiful design. As with most of Ming’s Mark’s outdoor mats, they made sure to add in a carrying bag. As mentioned in a previous review, this feature is a necessary one due to my storage issues. And I like when a company makes sure to add in an accompanying product that will help ensure your experience with their product is a positive one. It just shows that they have some sense of caring about the people that purchase their products. This sense that Ming’s Mark cares about its customers got heightened when I came across the price. Honestly, this price is exceptionally, especially, at the sizes they’re offering; it’s almost unheard of in the RV patio mat market. But theirs is one significant issue I have with this mat. See, if it’s left alone, it has a proclivity to blowing away in powerful winds. Now, this issue is sadly a deal breaker for me because of the heavy winds I tend to encounter on my trips. In the end, I don’t want to buy another mat in a couple of months. And if I buy this one, I’m afraid that’s precisely what would happen. It’s a shame too because I do think the blue/beige design would look amazing outside my camper. However, there are corner loops for stakes, so, I might have to think about this further before committing one way or the other. As of right now, this mat would be on the top of my list, but apprehensively. Our second Reversible Mats product on our list, the Reversible Mats RV Patio Mat, continues to further the pristine reputation this company has; it’s another high-quality product with a myriad of features that I love. Just like our first Reversible Mat product, it’s incredibly lightweight even in its larger sizes. Honestly, the mat’s weight is a huge factor because I don’t plan on spending a lot of time in one area. I like to move from place to place, so, lugging around a heavy patio mat would get annoying. And with this product, I wouldn’t have to worry, especially, with the inclusion of the carrying bag. Again, I can’t say enough about how huge a carrying bag is regarding convenience and storage; it’s indeed a godsend. Overall, this mat is remarkably similar to the first Reversible Mat product we reviewed. It’s made from breathable material, easily cleaned, mildew/mold resistant, and comes at an affordable price. Honestly, the main difference between these two products comes in the design, which I like better than the first mat. It seems like it’s more vibrant and inviting than the design of the first product. The only other difference is you do have one less size option with this mat. But in my case, it doesn’t matter because I’m looking for a bigger size than a six by 9-foot patio mat anyway. But on the negative side, this product even has the same issues as the first one with the material being known to rip in certain situations. Again, this issue is just something I can’t have in the mat that I buy. It just wouldn’t make logical sense. So, in the end, I’d put this mat over the first Reversible Mat product based on the design, but I wouldn’t purchase either because of the ripping issue. However, I’d expect there’s a ton of campground RVers that would absolutely love this mat. 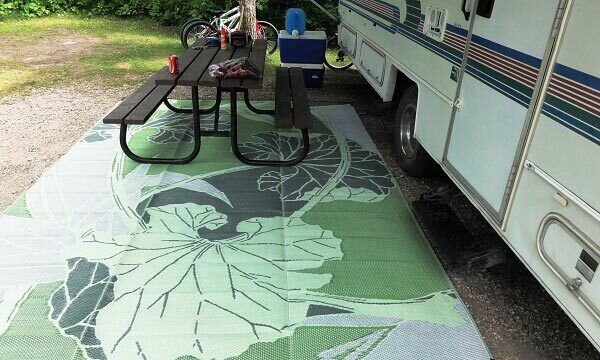 The Stylish Camping RV Home Mat is a very uniquely designed patio mat that will more than cover your RV patio mat needs. Honestly, I can’t get over how cute the design is, it’s indeed a must-have for an RV owner. Besides having a cute design, this mat also has numerous other features that make it a top-notch option. See, like other products on this list, it’s made with breathable material that keeps the grass under from dying. As explained above, I love that the manufacturer made sure to keep their products environmental conscience. Other than it, it has those all too essential corner loops to ensure you keep the mat from blowing away during those windy days. But the one aspect I truly love is how this mat only weights 12 pounds. Now, that might sound like a lot compared to the other mats on this list. However, this mat is much bigger than most of the other mats on here. Therefore, the fact the manufacturer committed to keeping the weight down, even though it’s a significant product, shows their creative ability. And it makes much more accessible to store and move from place to place. Add in that essential carrying bag, and you have a top-notch product. Honestly, if you saw someone else with this mat, I’m pretty confident you’d be jealous. I know, I am right now. But it’s no surprise that this sense of jealousness I have would affect one other aspect regarding this mat: the price. 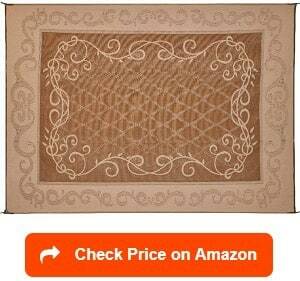 In my opinion, the price is a little outlandish for a patio mat. 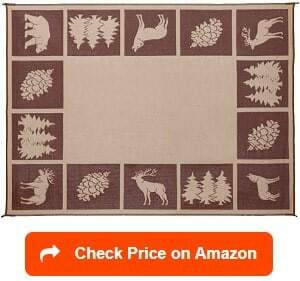 However, I think I’d be okay with buying this mat, but it doesn’t come in a small enough size where storing it in my camper would be manageable. So, I’d have to pass. 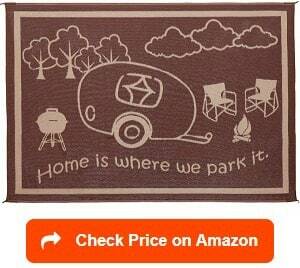 But if you have a larger RV, you should get this mat immediately. As with all Reversible Mats’ products, this breathable mat will make sure you won’t have issues with its effectiveness. In fact, they pride themselves on this and offer incredible customer support. Ironically, I didn’t find much mention of the customer support on the other Reversible Mats’ products we reviewed. This finding could be for many reasons, but I think it’s because there are far fewer reviews on this product than the other products. Therefore, there less research to sift through. But nonetheless, the majority agreed the customer service was top-notch, and I love to see this as a customer. As you know, no companies perfect and one willing to help you have a positive experience with their product is one you can trust. Aside from the Reversible Mats’ fantastic customer service, the best part about this product is its available in three different designs. Now, I don’t know what it’s specifically about this product, but the company made sure to bring their A game. Otherwise, this mat from Reversible Mats is what you’d come to expect from this great company except for one small difference; this mat seems to rid its self of the tearing curse that haunted the other products. But with this new ability, the price has gotten a little steeper. With this in mind, I’d still put this at the top of my list, mainly, because it seems everyone who’s bought has either had a positive experience with the product or had a simple shipping mishap that was quickly fixed by the company. In other words, I have a new favorite. Our first and only wholly eco-friendly RV patio mat, the Fab Habitat Tangier Recycled Plastic Rug is the best outdoor rug for camping. It’s also an environmentally conscious person’s dream. See, its made entirely from recycled plastic water bottles and straws. Pretty neat, right? Well, just think you could be sitting outside in front of RV knowing the thing your chair’s standing on is helping the environment. I think that’s a pretty cool thing to experience. Besides making you feel good about helping the environment, this recycled bottle material also doesn’t compromise any other area aspect of the mat. It has all the things you’d come to expect out an RV patio mat; mildew/mold resistance, UV protection, doesn’t hurt the grass below it, etc. 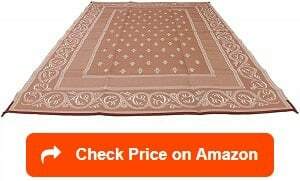 With all these features, its no wonder this mat has such a high rating on Amazon. I mean, it does everything it claims it can without pretending to be something it’s not; that’s all you can ask for out of a product such as this one. Honestly, Fab Habitat did an incredible job cultivating a product that you couldn’t tell was made from plastic bottles. It’s just everything someone like me could ask for in an eco-friendly mat. But there are a couple of issues that knock this mat out of the running for me. Although I cared about the environment, the price this thing has is a tremendous uptick from the range I’m willing to spend, especially, considering the lack of size options. I, sadly, can’t justify spending this much on a mat, even one as fantastic as this, to my bank account. It’s just not in the cards. But if money is no object and you’re looking for a smaller mat, make sure you pick this one; it’s perfect. Well, here we have another Reversible Mats product, Reversible Mats Outdoor Patio/RV Camping Mat, on our list. I know, you’re probably tired of me singing their praises; however, with products like this, they continually show they deserve my admiration. With this particular product, Reversible Mats did very little different than their other products, so, I’m going quickly cover the commonalities; carrying bad included, breathable material, UV protection, easy to clean, etc. In other words, it has everything you’d think it does, but what makes this one different is the palm tree design. I know, I made a big fuss about the last Reversible Mats’ design, but trust me, this one is just as fantastic. See, the design has a palm tree theme that will light up the mood as an actual palm tree would do. And it comes in two different styles that will for sure appeal to your fashion sense. I mean, I don’t know how anyone wouldn’t like the Black/Beige design, but the other one isn’t a slouch either. In the end, it’s a fun, vibrant design that will help bring life to the front of your RV or camper. And it comes at a price that won’t exactly break your bank account, which is always a nice touch. But there’s one thing that does make this mat problematic; there are only two available size options. Now, this issue might not be a problem for people with bigger RVs: the available sizes are pretty big. But for camper owners like me, we need an 18-foot long or even 12-foot long RV mat unless they come at bargain prices; not even one that’s this incredible. All in all, it’s another win for this company, but it’s a win that doesn’t gel with what I’m looking for; it could, however, gel with what you’re looking for in an RV patio mat. If you’re looking for a long-term RV patio mat, this product, the EZ Travel Mats RV Patio Mat, might be your best option. 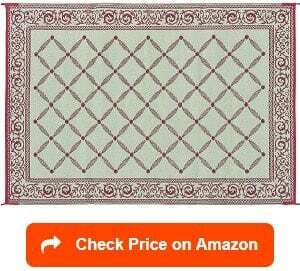 I mean, most of the customer reviews explain how shocked they were by how long this mat has been able to last. As someone who despises shopping, ironic I know, having to get a new RV patio mat every couple of camping seasons seems like an exhausting process. In fact, I’d probably refuse to do it until the old patio is utterly unusable. So, I could see how this product made from long-lasting, durable material could appeal to a vast number of RV owners. And with the insane amount of design options, this product seems like a real crowd pleaser. Other than those two qualities, this product is a standard mat with the UV protection, lightweight, breathability, reversible design, etc. It has all the positive things you’ve seen in the other product reviews. But what it doesn’t have is something that really bothers me: the carrying bag. It just doesn’t make logical sense to me that this company wouldn’t include a carrying bag with each purchase. The funny thing is they do mention a carrying bag in the product description, but as a separate thing you have to buy; they’re trying to profit on an item other reputable companies will include without an extra cost. It’s a shame too because their product is easily one of the best on the market and even though I’m annoyed I’d still consider buying this mat. However, the price, even without the carrying bag, extends past what I’d expect to pay for a patio mat. Therefore, this product is a no-buy for me. 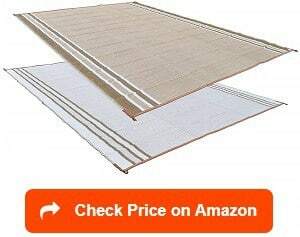 But if you’re willing to pay this much for a patio mat, buying this product now could end up saving you money later. 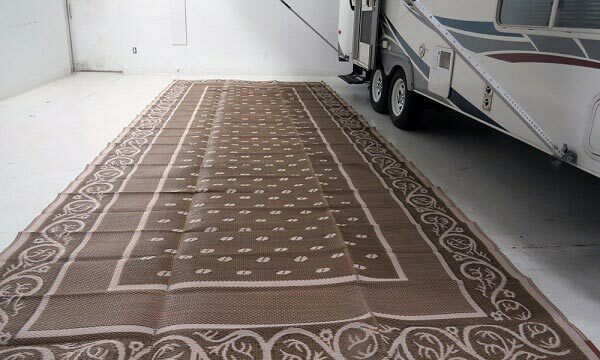 The Balajees Indoor/Outdoor RV Picnic Mat Rug is a fantastic, versatile option that any RV owner looking for a smaller sized mat should consider. Honestly, there’s nothing more you could want out of a smaller mat that this product couldn’t offer you. For one, I love that it can be used anywhere you’d think of putting a rug. From the pool deck to the garage, this mat will keep the area stylish with its singular design. Although I dislike the lack of options, I do have to admit the design is pretty slick. Otherwise, this mat is pretty unremarkable, but this doesn’t mean it isn’t a high-quality product. After all, if it wasn’t, why would it be on this list? Well, the reason this mat’s on this list is a simple reason; it does its job without any nonsense. In other words, this mat is proven to withstand any issue that it comes across. For instance, your pets stand no chance at ripping this apart unless you have a Pitbull or a rambunctious German Sheppard. And let’s be honest; there’s not a mat on earth that could withstand the jaws of those two dogs. So, if you’re looking for a high quality, no-nonsense RV patio mat, this mat might be the perfect option for you. I didn’t even mention the relatively affordable cost and lightweight portability. In these regards, few are better than this mat. But the lack of size options does give a little concern. I mean, there’s only two, and they’re both on the smallish side. Therefore, if you’re looking for a bigger patio mat, steer clear. In my case, I could see myself buying the 12-foot long option and being plenty happy considering the bargain price. Another affordable option for the bargain bin buyers, the Fireside Patio Outdoor Reversible Patio/RV Mat, doesn’t have a lot of undesirable qualities from a customer’s point of view. For example, I love how incredible durable its even when facing some of the worst nuisances on earth such as rain, sun, or human beings. 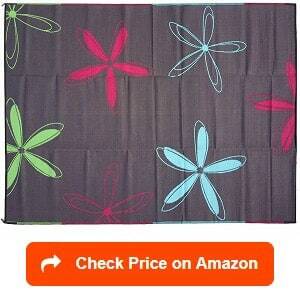 Each of them fails to make a negative impact on this wonderful patio mat. Furthermore, Fireside Patio made sure another nuisance, wind, didn’t have its way with this mat either by including corner tie downs to reduce the chance heavy winds could blow this mat away. And as someone who regularly faces heavy winds, I truly appreciate this feature. 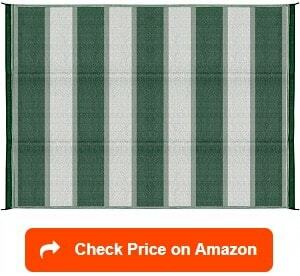 In fact, it’s among one of the first features I look for in any patio mat I’m considering. It’s such a practical feature that a mat not having it seems almost second rate. After all, I couldn’t imagine a worse experience than watching your brand new patio mat fly away into the wilderness because it didn’t have a proper tie down system. I mean, I could imagine a worse experience, but for dramatic effect, I won’t. Nonetheless, to sum up, its ability to withstand nature’s elements is second to none. Due to this, no RV owner should underestimate its peak performance as an RV patio mat. But it lacks in two crucial areas: choice and storage capabilities. See, Fireside Patio only offers one size and design option for this product, which isn’t ideal. Also, the lack of carrying bad is a bummer. And since the size mat I’m looking for isn’t the one they’re offering, this product a no buy for me. It withstands the damage caused by rain, sun, and regular human usage. Our second product from Camco, the Camco RV Mat, is considered by some to be the best RV outdoor rug on the market. And with that distinction, its fantastic dirt fighting capabilities shouldn’t surprise you. See, it was specifically designed to help keep dirt from entering your RV, which it does with its incredible reversible woven material. This material also makes sure rain and snow drain through the mat. As someone who expects to face both rain and snow on my travels, this woven material would be quite handy. I wouldn’t have to worry about leaving this mat out in the rain or snow unless it was a massive storm. With this feature, it gives peace of mind knowing I’d have one less thing to worry about during my hopefully stress-free trip. This mat would also further reduce my stress with its corner loops. As mentioned before, you can put stakes inside these corner loops to help keep the wind from blowing away the mat by holding the mat down. And Camco had the decency to include the stakes along with your purchase without raising the price all that much higher. It’s stuff like this truly noble and generous gesture that makes me think a company like Camco has the customer on its mind first rather than making a quick buck. They even further appealed to the customer by also giving them five different design options. But they failed to fix the one issue that plagued the first product we reviewed by them: the material is easily torn. And as explained in the first Camco review, I don’t have a luxury of spending money on a product that’s known to tear in rough terrain. Therefore, it’s a second no buy for me on Camco products. With its floral design, the Epic RV Mat Patio Rug separates itself from the pack by being easily the most colorful mat we have on this entire list. Due to this, it’s probably the best mat we have on this list at creating a fun, lively environment. And honestly, its ability to cultivate this atmosphere is its main selling point. I mean, I don’t know how you could look at the design and not smile. It just exudes happiness and warmness. Besides the atmosphere it creates, it does have a few other features that are worth mentioning. First, the mat doesn’t retain heat; therefore, you never have to worry about walking across it on a hot summer day. Second, like a lot of other mats on this list, its made of breathable material, so, you don’t have to worry about the sun killing the grass under it either. So, to sum up, it doesn’t burn your feet or kill the grass; I’d say those are both pretty big positives in my book. Other than those two features, there’s nothing worth mentioning on the positive side that we haven’t covered extensively in the other product reviews; it’s easy to clean, reversible, mold/mildew resistance, etc. But what is worth mentioning are the two flaws this RV patio mat does have; it has no carrying bag, and its price is too high. 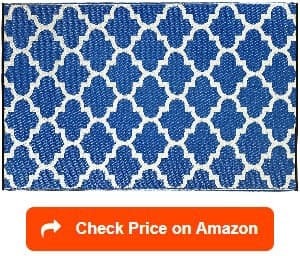 And since I can’t either afford the cost or most likely fit it into my camper, I don’t see a way I could end up buying this particular patio mat. In the end, the floral design wasn’t enough to keep this mat in the running. However, if you don’t mind paying a little extra for something nice to look at, this mat could be an option worth considering for you. The Redwood Mats Patio Mat is all-inclusive RV patio mat. In other words, it comes with both a carrying bag and four ground stakes; our first product on this list that provides its customer with both inclusive items. However, the inclusion of these items isn’t the only thing this mat has that I love. For instance, Redwood Mats offers a money back guarantee that conveys confidence in its product that I like to see. Furthermore, it has a textured surface that prevents slipping and improves traction, which could be a nice touch, especially, with the rough terrain I plan on encountering. And with my clumsiness, I’ll take all the help I can get. Other than that, this mat is pretty much what’d you expect from an RV patio mat/rug. It has breathable material to help the grass resist damage, four corner loops, UV protection, mold/mildew resistance, etc. Honestly, it’s a top-notch product that seems to cover all the bases. But I did have a couple of concerns. First, in my research, I kept coming across complaints about the smell this mat gives off in the sun. As someone who can’t stand the smell of burning plastic, I could see how this issue could be problematic for me. Now, if you this were reasonably priced, it wouldn’t stop me from buying this mat. But isn’t reasonably price; therefore, it doesn’t matter about the smell issues because I wouldn’t buy this regardless. Either way, if you’re seriously considering purchasing this product, I’d recommend doing more research into the smell issues. It may seem like a small issue, but it could end up being a problematic nuisance that ruins your RV experience, and nobody wants that to happen. Comes with a carrying bag and four ground stakes! Our last product on our list, the Reversible Mats Patio Outdoor Camping Garden, is shockingly from Reversible Mats. And being a Reversible Mats product, you can guess the features it will have by now. If you can’t, here’s a quick refresher: comes with a carrying case, UV protection, breathable material, easily cleaned, lightweight, etc. And since it’s a Reversible Mats product, you can confidently bet the product indeed has all these things. And the customer reviews sure seem to back up this accretion. I wouldn’t expect anything less from a product form this company. Now, where this gets interesting is the area where the difference between these products becomes apparent, and that’s in the design and size options. In this particular product’s case, you have four different design options: each of which is very stylish and sleek. Honestly, you couldn’t go wrong with any of them. But for me, I’d have to go with the Green option, as it would fit perfectly right outside my camper. As for size, you’re only allowed to purchase a 12-foot long product, which doesn’t fit my needs. I’m disappointed because I do think I liked the Green design better than any other design on this entire list. But now I think about it I could make a 12-foot long RV patio mat work with my camper, especially, at a bargain price such as this one. So, with this in mind, I think our last product might be the perfect one for me! Buying an RV patio mat isn’t a simple process. See, there are many different things you must consider before deciding on the best RV mat for you. I know, it seems like it’s a straightforward process, but the following factors need to play a role in your decision. What Type of RV Patio Mat Do You Want? There is a vast collection of different types of patio mats available for you to buy. However, you must think about what which type fits your personality and circumstances the best. Honestly, it’s essential information to know in your search for the perfect RV patio mat. For example, let’s say you’re a very environmentally conscious individual; you won’t want to get a patio mat that caused harm to the grass it’s put on, would you? In fact, you’d probably opt for the RV patio mat made from recycled plastic bottles mentioned in the product review section. For me, I wouldn’t go as far as buying the mat made from recycled plastic bottles; it’s pretty expensive. However, I would make sure the mat I chose was at least a breathable or grass-friendly one. With these mats, you can ensure the mat doesn’t kill the grass it’s placed on; they’re made to allow water, sun, and air to pass through the material. In the end, it’s stuff like this that will decide which patio is worth purchasing for you. One of the main features you’ll see with these patio mats is the inclusion of an accompanying bag as it can be very helpful in storing process of the mat. However, with the addition of an extra item, comes a higher price. Therefore, you must decide whether or not you see this extra bag as an essential feature for your patio mat. For me, I’d get a one with a carrying bag because I don’t want the extra hassle of carrying a folded up mat. I mean, it seems like a hassle to try and store inside your RV without having a specific bag for it. Just seems to be impractical and overall inconvenient for any RV owner. Besides the carrying bag, other features you must consider are things such as UV protection, mold/mildew resistant, waterproof, reversible, etc. 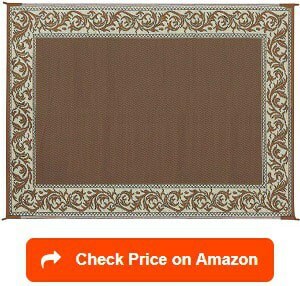 Once you decide which features you want, the market for patio mats will shrink drastically. In my opinion, I’d opt for all the above with features. I’d want my RV patio mat to be reversible, UV protected, mold/ mildew resistant, waterproof, and everything else I could get for a reasonable price. After all, there’s nothing wrong with getting a patio mat with the most features possible. When buying an RV patio mat, make sure you think about how much you’re going to move it around. 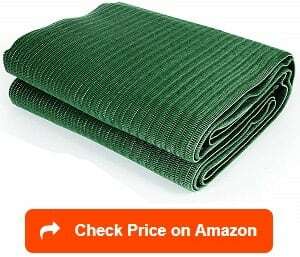 For example, let’s say you’re an RVer with a small camper and stays in places for short periods of time; you’re going need a lightweight and smaller RV patio mat. In this scenario, it won’t make sense to get an 18-foot long mat. See, these mats take a lot of effort and time to move around/set up. It wouldn’t be the logical choice for an RVer with these circumstances. Also, think about storing an 18-foot long mat inside a small camper, talk about a nightmare. On the flip side, an RVer with a 40-foot long RV whose planning on staying in the same campground for six-months could benefit from an 18-foot long mat. See, these RVers would only need to move the mat twice during those six-months; once when the first set it up and once when they’re packing up to leave. And with the size of their RV, they have more than enough room to store it comfortably. Overall, you need to figure out if you’re more like the first example or the second and adjust your search. After you do, the available options will continue to shrink into a more manageable amount. The environment around you should be a huge factor in the type of RV patio mat you end up getting. For instance, if you’re going to a very raining place, you’ll need a waterproof mat. On the other hand, if you’re going to place like Arizona where it’s dry and sandy, a sand mat should be more your speed. We don’t review any sand mats in this article; however; however, this product is one of the very best. Besides rain and sand, a windy area could be a very damaging adversary for an RV patio mat. With this in mind, if you’re in a windy area, please make sure to secure your mat with some stakes or rocks: if you don’t, it will blow away, and you’ll be buying a new one soon. All in all, it’s all about matching the environmental circumstances of the place you’re RVing to your mat’s features. Once you find the perfect match, you should easily find the best RV patio mat for your RV adventures. Of course, if you don’t plan on RVing outside campgrounds, this factor doesn’t match much because concrete doesn’t offer any significant issues. In this case, just try to find a mat that fits your style and taste. Now, don’t think RV patio mats are just for your using outside your RV. See, the features these mats have can be used in other areas as well. For instance, if you have a mildew or mold resistant mat, why not use it on your pool deck at home? It sure could help reduce the amount of water your that kids track back into the house. Along the same lines, if you have a sand mat, why don’t you use it on the beach? It could help give you a place to put your stuff instead of relying on an uncomfortable towel. Just think you’d no longer have to worry about the sand being a significant issue when coming home from the beach. All you’d have to do is put your belongings on the sand mat, and all of them would be sand free. Overall, it’s little things like these factors that could help you get the best bang for your buck. And that’s what we’re trying to help you get; the best bargain that fit your personal needs and wants. In this section, we ’ll try to answer any remaining questions you have about RV patio mats. Mainly, it will be what you’d expect out of any other FAQs section. What is an RV patio mat? An RV patio mat is exactly what it sounds like a mat that sits outside your RV acts like your RV’s patio. But its real job is creating a living room atmosphere right outside your RV. In other words, it’s there to make you feel relax and at home during those RV trips. It, basically, creates a place outside where you can set up a chair or whatever to escape the stuffiness of the RV. Otherwise, it’s a tenacious defender against dirt by giving you somewhere to wipe the dirt off. In a sense, it’s a buffer zone between the outside world and your RV. What Are the Types of RV Patio Mats? As you might expect, there are many different types of RV patio maps and listing them would take up a whole article. However, I thought it’d be a good idea to highlight some of these types, so, you can get a better idea of what you’re looking for in an RV patio mat. The first type is called a breathable or grass-friendly mat, which as the name suggests, makes sure the grass under the mat doesn’t get damaged. They ensure the grass’ safety by allowing light, water, and air to pass through the mat. Therefore, if you plan on having an extended stay in one area, I’d recommend getting a breathable or grass-friendly mat. After all, we want to preserve the grass as much as humanly possible. Along the same lines, you can help preserve the environment even further by getting an eco-friendly mat. These mats are made out of plastic bottles and other plastic materials to ensure these items don’t continue polluting the earth. With these mats, you can enjoy the pleasure of sitting outside your RV while also, knowing you’re helping the effort to preserve the environment. Pretty cool, right? Besides these two types, you can pretty mind an RV patio mat fit to handle any situation you could think of experiencing. Therefore, it’s all about what type of mat fits your particular preferences and lifestyle. And with all the types available, I’m confident this mat won’t be too hard to find. The mat you pick could be made of a million different things. Honestly, these mats come in a vast number of different materials. I mean, some are even made out of recycled plastic bottles. But, in general, your mat’s going to be made from sort of polypropylene material that doesn’t quickly come apart. Most of the time, the manufacturer will choose function over fashion when it comes to these mats. In other words, these mats are made to last rather than to look cool or stylish. However, this doesn’t mean you can’t find a mat that will fit into your fashion sense or preference. In fact, as you saw from our product review section, some of these manufacturers are pretty creative and clever with their respective mats. Therefore, you shouldn’t have any issue finding a mat that is made from a material you approve of and has a creative design. Why Do You Need an RV Patio Mat? Honestly, you don’t necessarily need an RV patio mat. However, it’s a lovely thing to have around because it creates a homey atmosphere that makes those camping environments feel a lot less foreign. Also, there are numerous other benefits that come from having one. For example, they keep your RV clean by helping reduce the amount of dirt that ends up inside. As you know, dirt can be a real nuisance and end up in every crevice or your RV. With an RV patio mat, this nuisance becomes less of an issue. Along the same lines, this patio mat gives you somewhere to put your outside furniture. I mean, who else is tired of placing their table or chairs on the rock-hard ground? Therefore, an RV patio mat would make this issue disappear and get you somewhere soft and clean to put your outside furniture. And just like how it keeps you from tracking dirt in, it also reduces the risk of your furniture doing the same. 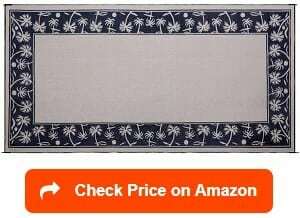 Where to Buy an RV Patio Mat? 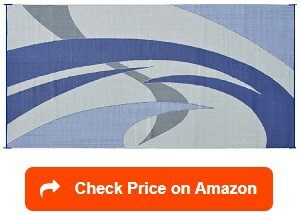 Like all things, Amazon’s a fantastic place to shop for an RV patio mat. 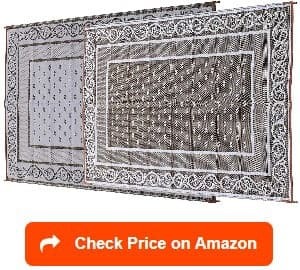 However, since you already know about Amazon, I’d thought it’d be nice to shine a light on another site where you might find your newest RV patio mat. Camping World is a niche camping site that will more than fulfill your needs for any camping related item. Honestly, if I was in the market for an RV patio mat, I’d compared any Amazon price to the one on Camping World; it might turn out its cheaper on Camping World. And if you aren’t comfortable shopping online, you should be able to find a high-quality RV patio mat at any Target or Wal-Mart. Or if you find yourself in the vicinity of an actual Camping World store, they’ll definitely have what you need. In fact, if you can find an actual Camping World store, I’d try there first before a Wal-Mart or Target. Sometimes, they’ll have a better deal than Wal-Mart or Target, and they’ll for sure have a better selection. Cleaning an RV patio mat is super easy. If you get a high-quality outdoor/water safe water, cleaning it is as simple as sweeping it off. Furthermore, if you mat gets a little muddy or collected a lot of dirt, you can rinse it off with your hose. And if you need to drastic action against a filthy mat, you can take to the car wash or home and give it a deep cleaning with a brush and some soap. Remember, these mats are made for convenience. Therefore, cleaning them is going to be easy and shouldn’t take you much time or effort. However, make sure you read the packaging just in case there are specific washing instructions for the mat you purchase. 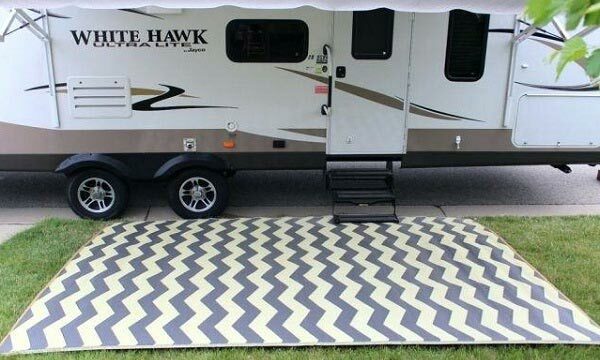 With the right RV patio mat, you can make your RV feel like you’re on the road home. And that’s why we have created this guide: to help you find the best RV patio mat for your circumstances. In the end, we want you to have the best RVing experience possible. And we feel the patio mats mentioned in this guide will help cultivate a fantastic experience you’ll never forget. So please, go onto Amazon and put one of these incredible products into your cart. I promise you won’t regret it. In fact, it’ll probably be worth every penny. I would like to thank you for reading this article. Find out more about how to find the best RV awnings and best RV awning lights with our guides and reviews. Furthermore, please take a look at the best RV mattresses to pick the right one for your RV bedroom, awnings and accessories.